While the Teramaze history dates back to the early Nineties, the band has really only come into it's own in the last several years. Their output has been consistent, with now three albums, including this year's Her Halo and a generally definitive sound. 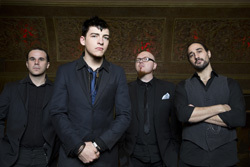 The only thing that has changed, since the last album, is the addition of new singer Nathan Peachey. Mostly, the Teramaze sound revolves around founder, composer, and guitarist Dean Wells riffs and solos. He's large on big heavy and thrashy riffs. Most songs are booming with them, only to be juxtaposed with breakdowns or lighter moments often featuring piano and/or vocals or his equally immense guitar solos. These things are abundantly clear from the start with An Ordinary Dream. Swelling with both riffage and eloquent solos, the song is one large canvas for Wells' guitar composition. Everything else is secondary. Sure, Wells and crew may boast in the importance of song composition. But melody, vocals and vocal harmony, and the vivacious rhythm section merely serve to carry or embellish his guitar work. I've listened to this album twice and this is pretty much the theme. Sure, Out Of Subconscious may have a notable symphonic layer, even some tempo manipulation, but it still remains about the guitar lines. For The Innocent is all about the riffage, reminding of earlier albums kinetic thrashy nature. The possible exception to all this is Broken, a relatively quiet song in comparison to the rest that moves upon Peachey's vocals, notably as it embraces and embellishes the song's melody and harmony. Frankly, while it reminds me of a modern post grunge anthem, between the vocals, vocal harmony, and delightful piano, it's the best song here. Possibly the best song Teramaze has ever written. And, oh yeah, Wells guitar solos are sweet and pure. It's a great song. You might even want to buy the album for this song alone. It's that good. Otherwise, Her Halo is merely Teramaze being Teramaze, delivering heavily guitar-centered melodic progressive power metal. 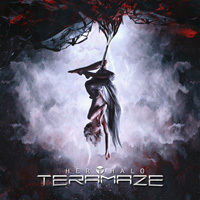 Her Halo is merely Teramaze being Teramaze, delivering heavily guitar-centered melodic progressive power metal. This said, don't miss the song Broken, a delight and one of their best songs, ever.